← What Blessing Is in Your Fort? I doubled over and laughed until I cried. I’m not sure my middle child appreciated my stop at Humor Station, but I simply couldn’t help myself. The train pulled up, and I was already in full guffaw. It struck me as so profound that what helped one child’s anxiety caused anxiety in another. Not every solution is for everyone. Sometimes we should not be squeezing lemons. And sometimes people are screaming at us to squeeze them—insistent they have the right wisdom to impart—but squeezing lemons isn’t what God is asking of us in that moment. A few years ago, a woman I knew was expressing nonstop angst about an activity we both shared. I kept telling her to hang in there and squeeze lemons. She ended up not taking my advice and getting out of a toxic situation before my own eyes saw it for what it really was. She may not have been right about everything, but she had wisdom I didn’t have at the time. She knew she wasn’t supposed to squeeze lemons and saved herself a lot of heartache. I later learned the lesson myself. We often assume our wisdom is a prophetic word for someone else. Sometimes it is. But often it is not. Are we mindful of this when we offer counsel? I recently wrestled with questions about the best way to school one of my children. In an effort to make a well-informed decision, I sought the opinions and experiences of folks who were educating their children in ways different than my own choice. None of them said to me: “You must do it this way because your way isn’t working,” even though, in some ways, it wasn’t always working. In the end, I chose not to make a change this year, but I was so thankful for the ability to bounce the possibilities around with people I trusted. But what about those who take our vulnerability and force their opinions on us? What about when we do that to others? The book of Job in the Old Testament is a hard one to read because in the middle of Job’s suffering, his friends offer some lengthy and often inaccurate advice. Were they wrong in all ways? Did they have good intentions? I’m not sure it matters, really. You see, the Lord knew what was ahead. He knew He was going to restore to Job beyond what had been lost, and He didn’t appreciate the friends spreading untruth about Himself to Job. He took that pretty seriously. The counsel of trusted friends is valuable, but are we to receive every piece of advice out there indiscriminately? No. We are to trust God Who promises to fill our mouth with what to say and instruct us in the way we should go. #Psalm81_10 I am the #LordyourGod, who brought you up out of the land of Egypt. Open your mouth wide, and I will fill it. Oh yes, Lord, fill it. Please fill it. Your words are so much better than mine. Squeeze away or set them down for someone else. His answers are personal to you because He loves you that much. **It has also been shared at any link highlighted here: Mom 2 Mom Monday Link-Up, Make a Difference Mondays, Pick Your Pin Tuesday, Women With Intention Wednesdays, Grace & Truth, A Little R & R, RaRa Link-Up, Dance With Jesus, Blessing Counters, Coffee & Conversation, Saturday Soiree, Tell His Story, Find Stability, So Much at Home, Faith-Filled Fridays, and Christian Mommy Blogger. That’s really interesting! Great analogy – not just the lemons, but the anxiety solution applied to a non-anxiety person. It really makes you understand that not everyone should get the same solutions. Thanks, ALadyinFrance! It was a surprise to me to hear her express that as well. I had to stop and think about how true that is about a lot of things. Thanks for coming by “Espressos of Faith”! Blessings! Sharon, I’m so glad you laughed. Thanks for coming by #EspressosofFaith! I need to remember to keep my own mouth shut when what sounds like wisdom didn’t go through His filter yet. Blessings! Beautiful post! I have “The Friend Who is Never Wrong, Except that She Always is for My situation” and “The Friend who ACTUALLY is never wrong who counseled me incorrectly a few times.” All that means is go ahead, collect advice from those you trust, but in the end, trust the Lord’s guidance ONLY. And yes, at times it can even come from a misguided friend. Oh man, Gina….are these blog posts or just scenarios? I need to go read about that. Thanks for relating to this. Your comments made me laugh. Blessings! I love this! And I will admit that I laughed at loud at your daughter’s predicament. It reminded me of when I moved home for a month after college, and I shared a room with my 14-year-old brother. Apparently having your 22-year-old sister bunking with you is not cool when your a freshman in high school. Good times! But back on topic. I love the message here. Sometimes I get frustrated when I see someone thriving in a certain situation that I can’t make work. It’s a good reminder for me that what’s helpful for one person, stresses another person out. And what God has planned for me, might not be what he has in store for my friends, too. Thank you so much for sharing your heart on this! Kelsey, I’m laughing at your room-sharing story since my freshman-in-high-school son is not pleased to ever share the room with any younger sibling. LOL I like your take on it….I hadn’t thought about it exactly from that angle…that some people prosper with something that isn’t necessarily for us. Interesting. Noodling that one over. Good thoughts! Thanks for sharing at #EspressosofFaith! I had to laugh at this! It reminded me of church camp in junior high and the cabin mom played a CD of crickets, none of us girls got any sleep either! You have caused think about the help/advice I offer to others. Stopping by from a little R&R. Winter…thanks so much for your comments! I’m glad it gave you a giggle! I look forward to finding you at #ALittleRnR! Loved your post in that it reminded me that we all are different and God deals with us all at our level. The lemon story is great. I know I was told to squeeze a few lemons when all I wanted to do was close up the lemonade stand and go home. Thanks for sharing. Visiting from Counting My Blessings. Oh yes, rmclellan….I’ve wanted to close up the lemonade stand to go home too…many times! I really appreciate you coming by and leaving your reflections. 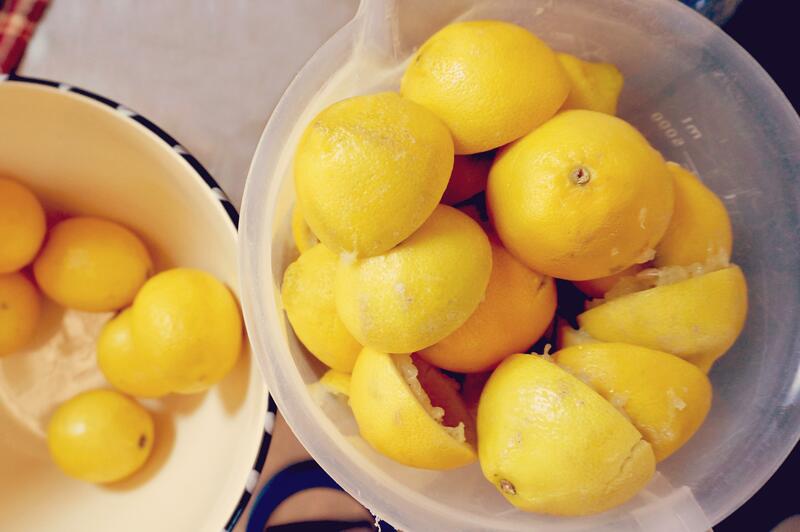 Here’s to not squeezing lemons when we’re not supposed to! 🙂 Blessings! Turning our eyes back to the One with the true direction, the Lemonade Maker. So true, as that’s where our help comes from. Truly enjoyed your read today, Bonnie Lyn, and I hope your sweet daughter dove into sweet dreams the next night. Neighboring with you at Counting My Blessings. Thank you, Kristi! I’m so glad you stopped by here at Espressos of Faith! It’s so good when we remember where advice should ultimately come from, isn’t it? The Lemonade Maker…love that! Blessings!